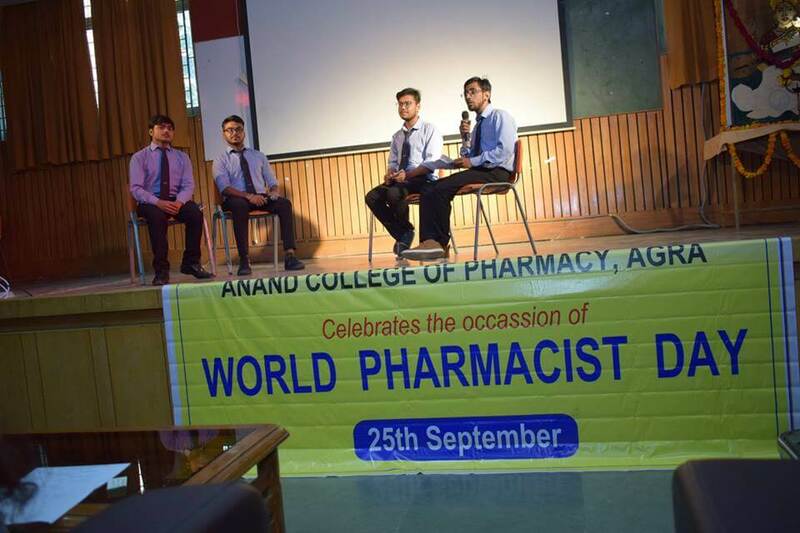 Anand College of Pharmacy (SGI) observed “World Pharmacist Day” on 25th September, 2018 by all B. Pharm and D. Pharm students with Awareness rally, Powerpoint presentations, Debate competition, poster presentations, slogan writing competition and rangoli making competitions, in two days 24-25/09/18. The program started with prayer and lamp lightning by Shri Pradeep Mahtha (E.V.P. 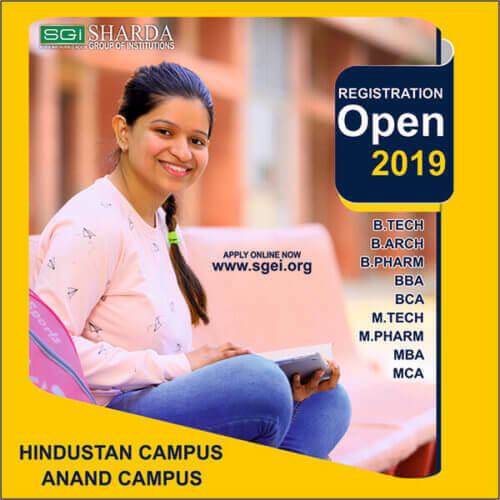 – SGI), Dr. Rajeev Upadhyay(Director , HCST), Dr. Naveen Gupta (Director ,HIMCS), Dr. Mukul Singh (Dean, ACA), along with Dr. Kashmira J. Gohil (Dean, ACP) at 11:00 AM in B.Pharm Hall. Dean, Anand College of Pharmacy Dr. Kashmira J. Gohil, addressed the all students as budding, upcomingpharmacist of college and delivered the Pharmacist day message conveying that the day is also officially mandated to be celebrated by Pharmacy council of India and that PCI & AICTE mails and wishes were received by SMS and on mail. Also that the Pharmacists need to utilize this noble opportunity to serve the community by using technological skill to their best of the abilities with right balance of kindness and compassion for self growth as well as others, as the science and technology alone, can not take away all the ills of mankind, was the gist of the message. Shri P.Mahtha (EVP, SGI), Dr. Upadhyay (Director , HCST), Dr. Naveen Gupta (Director ,HIMCS), Dr. Mukul Singh (Dean, ACA) also addressed the audience to motivate them. The class toppers prize cheque distribution was done in the session. In First early morning session, on the same day, Students expressed their creative ideas through posters, slogans and rangoli making. The Winner students were honored by Trophy & certificate distributions by Dean, ACP and faculties. The First prize of the Debate presentation won by Dimple Parashar (B. Pharm 4th Year), second prize to Aman Porwal (B. Pharm 1st Year) and third prize to Kartik Singhal (B.Pharm 4th Year) and Brij Kishore (B.Pharm 2nd Year). Slogan competition was won by Kunika Gupta (B. Pharm 3rd Year) who secured first, Arshad Khan (B. Pharm 3rdYear) secured second and Sona Thomas (B. Pharm 3rd Year) secured third place. The first prize of the poster presentation won by Samiah (B. Pharm 4th Year), second prize to Umesh Kushwaha (D. Pharm 2nd Year) and third prize to Kartik Singhal and Sushma (B. Pharm 2nd Year). In Rangoli Making completion Kartik Singhal and Ruksana Begum (B.Pharm 4th Year) stood first, Mohini Yadav and Kulsum Bano (B. Pharm 2nd Year) second and third by Raghvendra, Kuldeep and Sarita (D.Pharm 2nd Year). In Powerpoint presentation competition Deepak Mittal (B. Pharm 3rd Year) stood first, Samiah Rehman (B. Pharm 4thYear) second and third by Gagandeep Kaur (B. Pharm 3rd Year). On 24 Sept 2018, Awareness campaign and rally on Dengue, Chikungunia and Malaria were organized to create awareness for diseases in nearby rural areas like Lohakarera, Runakta. In this Awareness campaign, Faculty Coordinators Dr. Monika Singh, Ms. Preeti Solanki, Dr. Mukesh Kumawat and Dr. Deepali Pandey joined the students in this Awareness rally, which started from SUN LORDS PUBLIC School. Other schools covered are Samford (Jaupura, Agra), Shri R. S. Public School (Sikandra, Agra), Draupdi Higher Secondary School (Shastri Puram, Agra) In this campaign students give information about diseases, prevention and their treatment for dengue fever, Swine flu and others. The coordinators of the event were faculties, Dr. Monika Singh, Dr. Mukesh Kumawat, Ms. Preeti Solanki and Dr. Deepali Pandey. Mr. Gurvinder Pal Singh delivered a vote of thanks on the successful completion of the World Pharmacist Daycelebration and concluded the event.